Many truly enchanting picture books have crossed my desk in the last few months. These wonderfully illustrated selections are ripe for reading as summer comes to an end. Jimmy and his dad have “the best time ever” when Jimmy’s imagination leads them through shark-infested waters to a deserted island, turning an ordinary afternoon into an extraordinary adventure. When their imaginations get going, the dog’s leash becomes a fishing line, the staircase a mountain, and blankets and chairs become a cozy fort where the tired explorers can stretch out and rest. Plecas’ winsome art in ink and watercolor pulls young readers right into the fantasy game. Her clean, uncomplicated illustrations still allow for fun details like grinning fish, toothy sharks, and that merry puppy. Dad’s facial expressions are priceless as he vacillates between slight annoyance and genuine amusement. The book feels familiar and yet unique. It reminds me of the times I pretended that the floor was hot lava and my siblings and I had to walk on furniture, pillows, and record albums to get safely from the den to the kitchen. Today, my children like to imagine our family room as a swamp filled with alligators. Read this with your children and watch what it will inspire you to do! The slightly messy watercolor illustrations in a comic book style progression didn’t appeal to me at first glance, but I handed this book over to my six-year-old son and he loved it immediately. 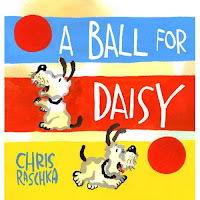 My son took delight in the very doggy antics of Daisy as she romped over the pages of the book chasing her big red ball, sleeping with it, and taking it to the park. He “awww”ed and grinned as he “read” each picture in the wordless book to me, easily communicating the story and making me an admirer, too. 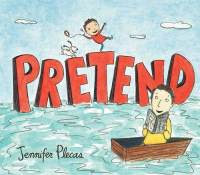 Inside this elementary story are the sophisticated feelings of joy, loss, sorrow, comfort, friendship and redemption. How does an illustrator manage to put all that into a 32-page book without words? Credit the messy magic of Chris Raschka. Crisp drawings, vivid colors and attention to detail are the hallmarks of this series. Soman has a terrific sense of perspective that he employs in creating an emotional landscape of freshness and innocence, adding so much enjoyment to these straightforward tales of tender youthfulness. In this latest book, our plucky friend Lulu (aka Ladybug Girl) hosts a playdate with her special friends, the Bug Squad. It is a day for costumes, craft projects, and follow-the-leader, where everything is perfect until a misunderstanding at snack time. Lulu’s stomach feels funny. She didn’t mean to hurt Kiki’s feelings. She’d never want to do that in a million years. It’s just that she was having so much fun that she didn’t think twice when she blew out Kiki’s candle. Lulu just wanted things to be the way she had imagined them. Luckily, Ladybug Girl is brave enough to say she is sorry. There’s no leaping over tall buildings in this series, no extraordinary heroics; just the personal courage required of a youngster in the everyday trials of growing up. And that is great courage, indeed. 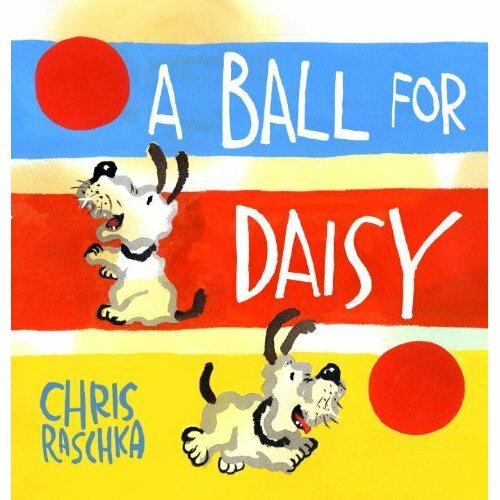 A simple story that has stood the test of time due to a brave hero, a clever solution to the conflict, and illustrations of ocean life that beg to be imitated. Were I an art teacher, I would share this story with a group of first graders and then set them to work with watercolors, sponges, doilies, and fish shaped stamps cut from foam to see if we might be able to create a beautiful ocean for Swimmy. 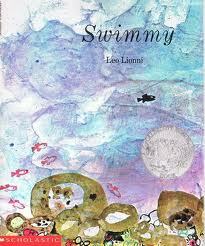 What fun we would have, mixing colors for strange fish and sea anemones floating on a rippled background of blue - just as I imagine Leo Lionni must have done in creating this magical story. 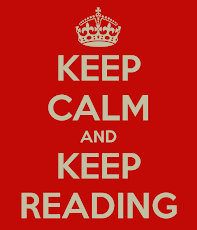 Readers must slow down and savor each page, because this one is over before you know it. That quality also makes it a great selection for tired parents who want to read a quick story before tucking in the little ones for the night. M. D. Clark happily relinquishes ¾ of her brood back to guidance of the wonderful teachers at their grammar school. She grows weary of the heat, and can be found hiding in the shade of a good book.